Seattle chefs Robin Leventhal and Ashley Merriman are still packing heat in the kitchen — and captivating viewers of “Top Chef: Las Vegas.” Meanwhile, Cafe Juanita’s Holly Smith is one of 10 contestants set to compete on season two of “The Next Iron Chef” — premiering Sunday at 9 p.m. on the Food Network. 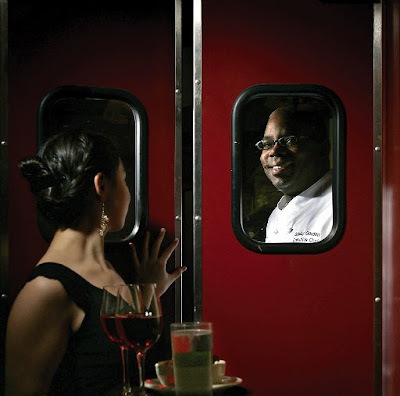 Daisley Gordon seen through the window at Campagne, and coming soon to a TV near you. Though he’s obligated to keep his mouth shut about the outcome of his fray with Flay, Gordon admitted he had a big-time blast filming the show last year. When he got the initial call from the Food Network folks, “I was surprised, flattered — and nervous,” he recalls. “I wondered, `Geez, why did they call me?’ I just didn’t think I was on anybody’s radar.” His opponent, whom he describes as “very professional, very responsible and very generous,” has been on his radar for years, though. Two years later the CIA-grad landed a job as lead-cook at Campagne, working with executive chef Tamara Murphy (who later opened Brasa), and sous-chef Jim Drohman (who took her place, later leaving to open Le Pichet). Murphy is one of only three other Seattle chefs who’ve taken the “Iron Chef” challenge. Tom Douglas famously triumphed over Morimoto in 2005 by preparing a five-course meal using wild salmon as the “secret ingredient.” La Spiga’s Sabrina Tinsley gave it up to Bobby Flay in January. Backing Gordon at Kitchen Stadium was his former sous-chef Nikki Schiebel (who still works part-time at Campagne), and lead-cook Keiko Okuda, who’s since moved on as well. “It was not a hard choice for me,” he says. “They’re two focused, tenacious people. Two very serious women who’ve got a lot of juice.” Douglas proved that choosing your on-stage assistants carefully can be the key to success on “Iron Chef.” His crew included his longtime right-hand-man — James Beard Award-winning chef Eric Tanaka, and Food & Wine Magazine’s 2009 “Best New Chef” Mark Fuller, now owner of West Seattle’s Spring Hill. 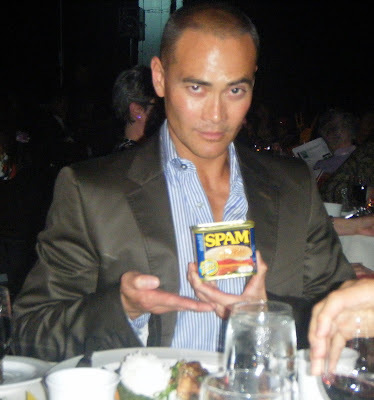 The Chairman raises a can o’ Spam in Seattle — while helping raise $250,000 at the 2009 Wing Luke Asian Art Museum Auction.